The quickie is now the fourth-highest wicket taker in the 2018-19 Ranji Trophy season. 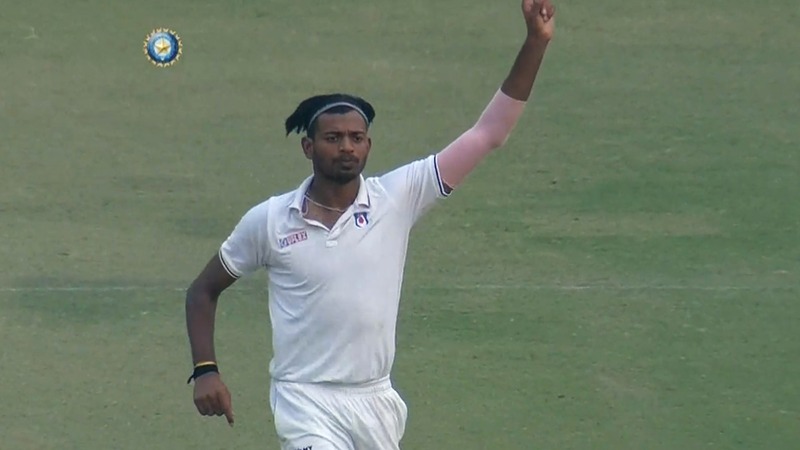 Ankit Rajpoot showcased another bowling masterclass picking up five wickets in the first innings of the fourth round Elite Group C Ranji Trophy match against Rajasthan at Kanpur's Green Park stadium and emerging as the highest wicket-taker for his side in the fourth straight game. The fast bowler, who represents Kings XI Punjab in the VIVO Indian Premier League, picked up five of the top seven batsmen for Rajasthan to complete his second fifer of the season and the seventh of his career. Cruising at 214/2, Rajpoot's destructive spell with the second new ball reduced Rajasthan to 222/7 within seven overs with the tall pacer taking four of the five wickets that fell, including that of captain Mahipal Lomror and the well-set Amitkumar Gautam and helped restrict Rajasthan's first innings score to 311. In reply, Uttar Pradesh scored only 214 to trail by 97 runs. Rajpoot responded to strike early in the second innings to reduce Rajasthan to 34/2 with the team eventually folding for 232 through Saurabh Kumar's 6/77. Rajpoot ended with figures of 2/42 and a season-best match haul of 7/103. Set a target of 330 with half a day to spare, Uttar Pradesh ended with 116/2 bagging a draw against the table-toppers. Rajpoot has picked up 26 wickets in four matches so far with a healthy average of 17.07 and is the fourth-highest wicket-taker this season. Punjab captain Mandeep Singh led by example to see his side through to a convincing 10 wicket win against Delhi in their Elite Group B Ranji Trophy match played at Delhi's Feroz Shah Kotla. Walking in at 38/2 in the first innings, KXIP's latest acquisition scored 90 off 180 balls on a difficult batting surface on which Delhi only managed a paltry 107. Mandeep stitched valuable partnerships with Jiwanjot Singh and Yuvraj Singh before perishing just 10 runs shy of a century with the score at 227/5. Punjab collapsed for 282 but it proved enough as Delhi could manage only 179 in their second innings, handing Punjab just 4 to chase for victory. Mandeep has now scored a fifty in every Ranji match this season and boasts a healthy average of 84.33 in Punjab's unbeaten start to the Ranji season.